Some interpretations of quantum mechanics rely very heavily on a certain style of counterfactual reasoning. Quantum mechanics teaches that an electron has wave and particle properties. It is observed as a point particle, but otherwise it behaves like a wave. The uncertainty principle says that you cannot measure the precise position and momentum at the same time. J.J. Thomson won the 1906 Nobel Prize for discovering that electrons are particles (his acceptance lecture called them "corpuscles"). His son won the 1937 Nobel Prize for showing that electrons are waves. The subject has confused people ever since. The interpretations differ in their view of the electron before it is observed. Some say that it is a wave, with no precise location. Others say that it is a particle, but a funny kind of particle that can be many places at once. It thus has multiple histories, unlike anything in our ordinary experience. The multiple histories get confusing when we consider counterfactuals. Suppose you ask, "where would the electron be if it were in a particular location at a particular time?" This question makes no sense because the electron could not be at a particular location at a particular time because of the uncertainty principle (unless a measurement is disturbing the system). Admitting that the electron could have been in other places as well at the same time only makes the counterfactual meaningless. To see how this dilemma plays out, consider the Double-slit experiment. 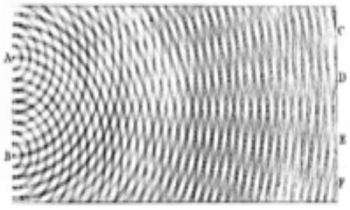 An electron beam is fired thru a double-slit, and wave properties cause an interference pattern at the detector. The confusion occurs when you introduce counterfactuals about which slit the electrons pass thru. You can ask "if the electron goes thru the top slit, then where is it detected?" The question has no clear answer. Attempts to answer it involve saying that the electron has some sort of spooky action-at-a-distance effect on electrons going thru the other slit. The best answer is to refuse to answer the question as a meaningless counterfactual. The question presupposes that the electron is a particle, and it is not a particle. It is a wave that goes thru both slits at once. If you put detectors in the slits then you find the electron in one slit or the other, but without the detector the electron cannot be localized to one slit. As Asher Peres explained, "unperformed experiments have no results." The electron only looks like a point particle when certain measurement experiments are done. If no such experiment is performed, then there are no point particle consequences. At this point you are probably wondering why we even talk about the electron as a particle if it is really a wave and if treating it as a particle causes so much trouble. The answer is that treating it as a particle is incredibly useful. Every electron appears identical, with the same mass, charge, spin, and zero radius. 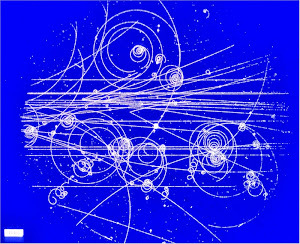 We can even see the particle tracks in bubble chamber pictures. R.P. Feynman worked out a diagram calculus for electrons where predictions are based on sums over their many possible histories. Under his interpretation, each diagram is a counterfactual but they all contribute real measurement. The particle interpretation of electrons and photons works quite well as long as you avoid something called counterfactual definiteness. That is, you must not assume that the particles have particular properties that could be obtained by measurement, unless you actually do the measurement. The 1965 Bell's theorem and subsequent experiments have shown the paradox of quantum mechanics more strikingly than the double-slit. The theorem has been called “the most profound discovery of science.” It is usually explained in terms of correlations between measurements on two equal and opposite electrons. The correlations are hard to understand, and have two common explanations. Either one measurement has a spooky non-causal effect on the other, or we have to reject counterfactual definiteness. Many physicists prefer the spooky explanation, and say that this proves that quantum mechanics allows non-locality, meaning one measurement can have an action-at-distance effect on another. As no experiment has ever demonstrated such an effect and we have no mathematical theory for how that would happen, this is indeed a striking conclusion. The better and more mundane conclusion is that quantum mechanics is not amenable to certain counterfactuals. The disagreement is about whether this conclusion is profound. To some physicists, this proves that scientific realism is impossible. To others, it just shows that some ill-posed questions are unanswerable, just like many philosophical and theological questions, such as "how many angels can dance on the head of a pin?" There has been no Nobel Prize given for work related to Bell's theorem. While there is talk of such a prize every year, others just shrug it off as just a metaphysical confusion about counterfactuals. All of the Bell test experiments have confirmed the 1930 understanding of quantum mechanics. Nature is not just the conjunction of quantum particle scenarios. An electron can be measured in a lot of different places, but the electron is not the union of those possibilities because that would not capture its wave properties. In a mystery novel, Sherlock Holmes might list five possible explanations for a crime, eliminate four, and conclude that the fifth was correct. You cannot do that with quantum particle interpretations because electrons are not really particles. It does make perfect sense in quantum mechanics to treat electrons and photons as particles with particle histories, as long as you admit that a large number of such histories are possible. The histories are like counterfactuals except that they cannot be said to be definitely true or false. They are just Feynman paths. They allow a particle interpretation of nature and have an extremely powerful predictive theory. Feynman paths and diagrams are used to explain the simple transmission of light. According to the theory, the simplest interactions involve infinitely many diagrams showing paths and collisions of electrons and photons. The diagrams might involve energy being created or destroyed, particles going backwards in time, and causality violations. Consideration of all of these ridiculous scenarios is essential to calculating an answer that agrees with experiment. You can choose to believe that all of these scenarios are real if you wish, but it is easier to think of them as counterfactuals. They are wildly implausible assertions that are somehow used to deduce a valid conclusion. You might think that agreement with experiment is strong evidence for the truth of the hypotheses used to make the numerical prediction. But in this case, it is not. The scenarios involve simultaneous precise positions and momenta for photons and electrons. We know that photons and electrons are not really particles, and they do not have specific positions and momenta. We also know that energy is conserved, and that cause precedes effect. We think we know those things, anyway. Thus it is convenient to think of quantum particles as having multiple counterfactual histories as Feynman paths, and the theory makes predictions as sums over all those paths. One cannot say that some paths are true and some are false, as all must be used to get correct numerical predictions and none can be taken literally. This interpretation is popular but not required, as it is also possible to treat the electrons and photons as fields instead of particles. For those who argue that time is an illusion, the possibility of multiple histories is very unsettling. They refuse to accept that the past is any different from the future, so they say that the multiple counterfactuals in the past implies that we also have multiple counterfactuals in the future. So they prefer the many-worlds interpretation, where all possible scenarios happen in alternate universes. There can be no physical evidence for alternate universes, but they find it more compatible with their prejudices against time. In my opinion, belief in many-worlds is nothing but a severe confusion about the nature of time and counterfactuals. The uncertainty principle says that measuring position and then momentum can give a different result from measuring momentum and then position. In quantum jargon, the observable operators do not commute, so the operator order matters. This is hard to understand if you believe in some sort of counterfactual simultaneous observation of position and momentum. But if you follow the Feynman-Peres advice against counterfactual definiteness, then it is plausible that the order of observation can make a difference. You need to reject counterfactual definiteness in quantum mechanics because the theory predicts observations that disturb the system. A system with an observation is different from one without. You cannot just assume that the system behaves as if everything were observed. If you did, then the electrons and photons would all seem like particles, and you would miss out on the wave properties. Counterfactuals are understandable by children but troublesome for philosophers. I have posted below about counterfactuals outside the context of quantum mechanics, in order to clarify them without the added quantum confusion. My conclusion is that the counterfactual is the most confusing thing about quantum mechanics. Understand counterfactuals and you will not be tempted to subscribe to quantum spooky interpretations, to believe in many-worlds, or to deny locality, causality, or realism. All of those mysteries are rooted in misunderstandings about counterfactuals. I enjoyed this, linked to from your post of four years later, http://blog.darkbuzz.com/2018/11/physics-rejects-counterfactual.html, so thanks. I'm commenting to suggest that one might say that "counterfactual effects" are effects that don't happen, which from the point of view of engineering is not so good, insofar as one is always trying for consistent effects for the causes one puts in place (consistent statistics of events, at least, if not consistent events). Or is that too simple-minded of me? From a more theoretical point of view, effects that don't happen can't be counted for the purposes of correlations and other statistics.